Thomas Henry Davis or "Boss Tom" as some knew him, grew up in Winston-Salem in the 1920's and '30's and was smitten, as a lot of us were, by airplanes in his childhood. From an early age he spent his time sneaking out to the Winston-Salem airport and hording his allowance to take flying lessons. When it came time for college, he was off to the University of Arizona in Tuscon where he signed up for pre-med. Still smitten by airplanes, he made a deal with the fixed base operator at the Tuscon airport to work part-time as a flight instructor. The real underlying factor here was he loved to fly and this way, he could fly for free. Opportunity knocked for Tom Davis in 1939 when he returned to Winston-Salem. L.S. McGinnis, his former flight instructor, offered him a job selling airplanes for Camel City Flying Service! Camel City was the North Carolina distributor of Piper Cub and Stinson Reliant aircraft based in Winston-Salem. The company also provided aircraft overhaul and maintenance, flight training and aircraft rental. In 1940, L.S. McGinnis and Camel City Flying Service was having a hard time repaying a note from R.J. Reynolds, Jr. (of the R.J. Reynolds Tobacco Company fame). Tom Davis stepped in and paid off the note to Reynolds and became the Vice Presient, Treasurer and principal stockholder. 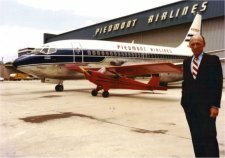 On July 2, 1940, Davis changed the name of the company to Piedmont Aviation, Inc. and the beginnings of Piedmont Airlines emerged as a glimmer in his eyes. By 1941, Davis and Piedmont Aviation had sold over 100 airplanes and established 17 new Piper and Stinson outlets at major North Carolina Airports. Also during that year, Piedmont Aviation became the first fully certified aircraft and engine overhaul facility between Washington, DC and Atlanta to be approved by the Civil Aeronautics Administration. In 1943, Thomas Davis became President of Piedmont Aviation. Realizing that government contracts of providing flight training for the military would end when the war ended, Davis applied to the Cival Aeronautics Board for a Certificate of Public Convenience and Necessity to operate a local-service passenger, mail and cargo route in the southeast. Davis fought and lobbied over the next 4 years for the certificate. On April 4, 1947, Piedmont Aviation was granted route 87, linking various points in North Carolina to the Ohio River Valley. Piedmont Airlines was set for inaugural flight September 7, 1947 with three 21-passenger DC-3's but was postponed due to protests of unsuccessful applicants. After reviewing the protest from State Airlines and Eastern Airlines, the CAB upheld Piedmont's original award granting certificate number 208 on December 12, 1947. State Airlines went to the US Court of Appeals in Washington, DC, which reversed the CAB's grant to Piedmont. Tom Davis and Piedmont Aviation appealed to the US Supreme Court and won. Piedmont Aviation was formed January 1,1948 separating the airline and Piedmont General Aviation into autonomous branches under the Piedmont Aviation, Inc., umbrella. At 7:05am on February 20,1948, Piedmont Airlines flight 41 departed Wilmington, NC for Cincinnati, with stops in Southern Pines, Charlotte, Ashville, Tri-Cities and Lexington. The passengers included Davis, who was not yet 30 years old, several company officers and	one paying passenger. No part of this web site may be copied or reproduced without prior written consent.